It surely is time for a new post! 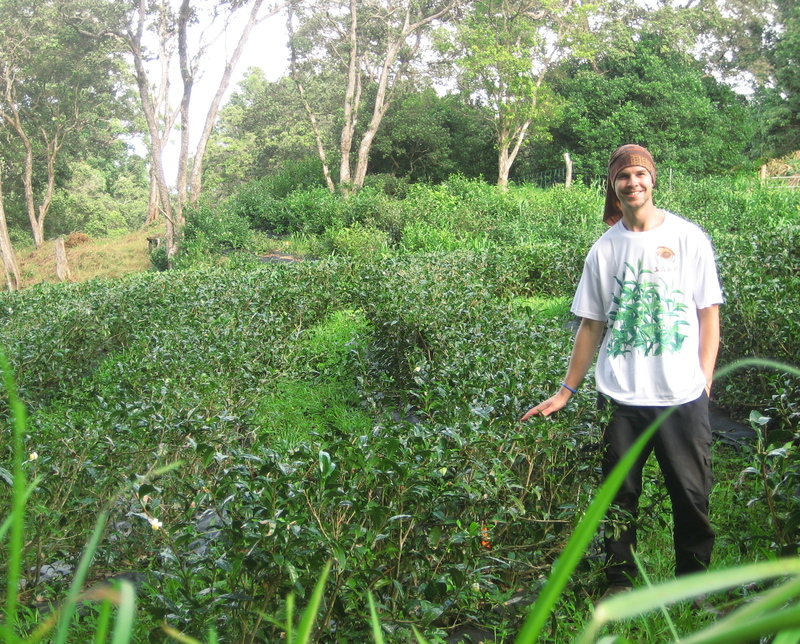 It’s been a busy last month in Hawaii wrapping up projects around the farm, harvesting tea, and packing for home! So here is a brief reflecting on my last four months. I’m actually back in Vernon for the time being catching up with friends and family before going off on my next tea excursion. This time, to the far away lands of Asia and into the rural mountainsides for some much larger-scale tea farming and processing. 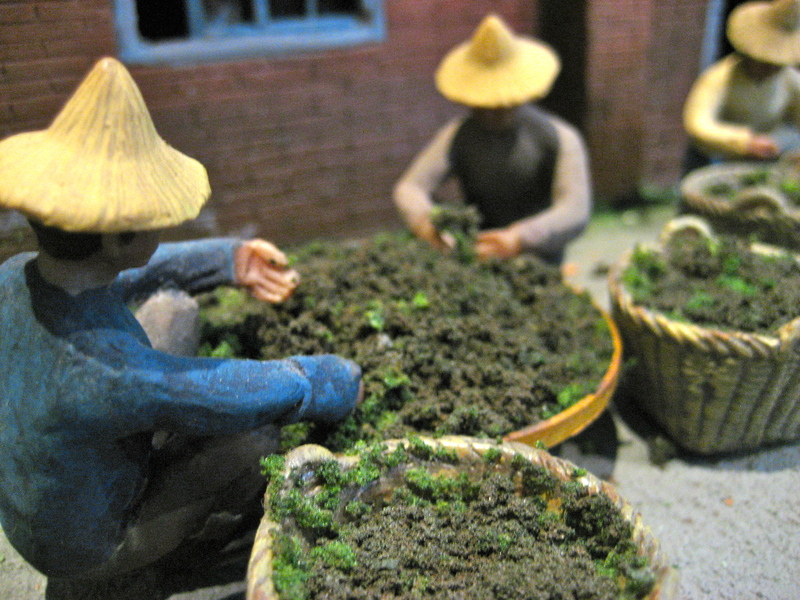 Planting a new tea garden this week and next. It’s on a slope as you can see from some of the pictures, so I built a simple A-frame level from pvc pipe, string, and a plumb bob to walk across the surface and find the contour line. 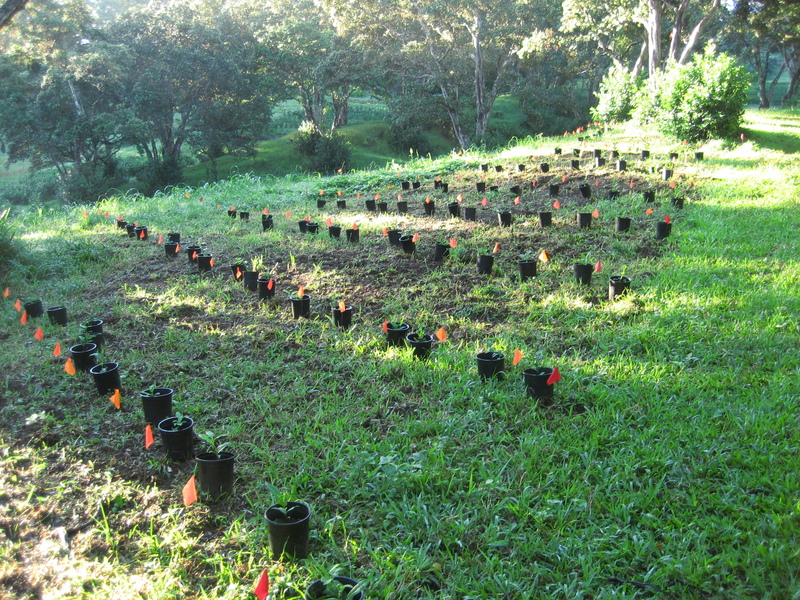 nothing beats planting tea on the sunny hill-sides in Hawaii. 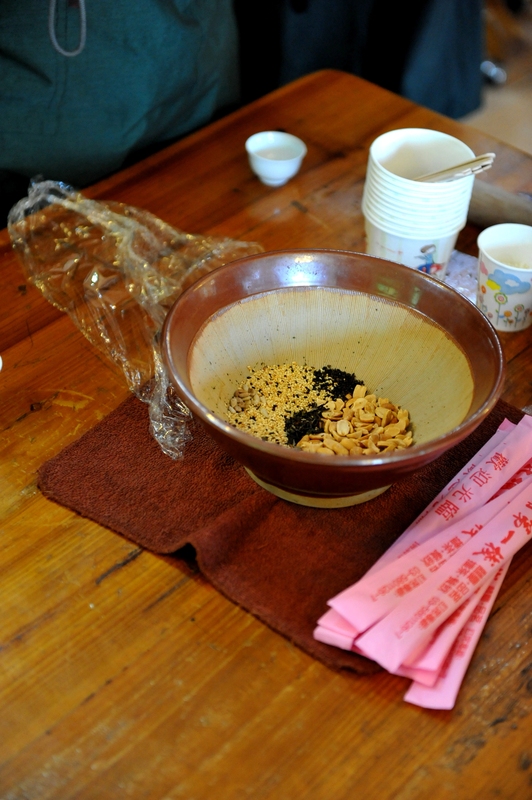 On the left, we have Lei Cha, a ground up medley of nuts, seeds, grains, tea, and tea powder brewed in hot water traditionally drunk by the Hakka people of Taiwan. 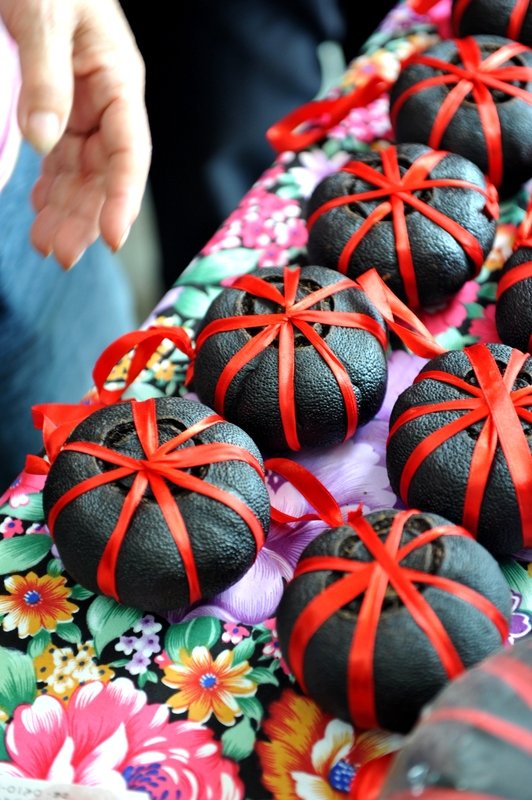 (Click here to see my previous post on Lei Cha with pictures). Pictured above right and below, I made some Kombucha using Ruby 18 Brandy Oolong Tea from Taiwan. 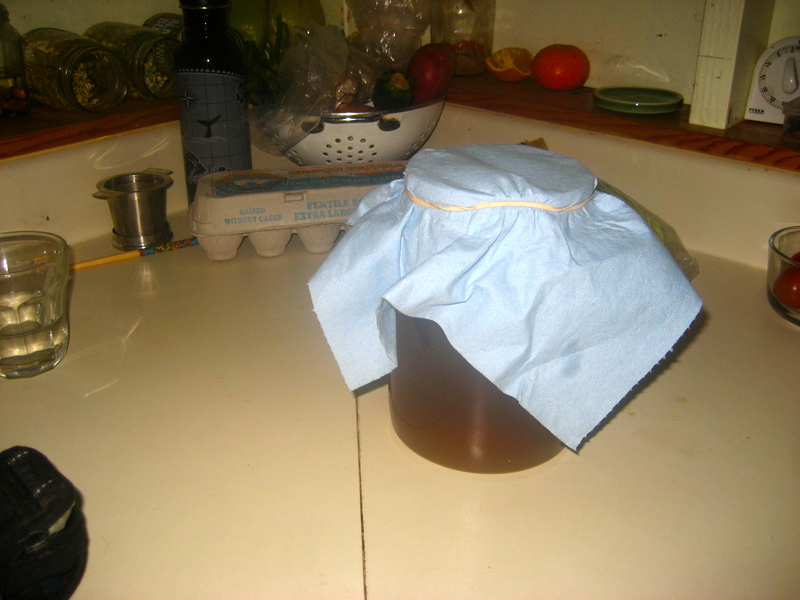 Kombucha is a fermented beverage often made with tea. It becomes quite carbonated and takes on a sweet and sour or sugary and vinegar-like taste. This particular batch was my first and it turned out great. I’ve now tried other batches with different tea, but Ruby 18 has proven superior and I will continue to ferment with it. Well, I’ve resided at Mauna Kea Tea for over a month now and haven’t given a proper post on my experience here. This morning moon is only visible from the farm at certain lunar intervals. I’ve only had a chance to follow the moon, and it’s moving all over the place! Notice the tall-growing grasses (sudan I believe) between tea rows. This is an attempt at cover cropping to out-compete against other weeds, develop soil structure, and add biomass in the form of green mulch when we cut them back. 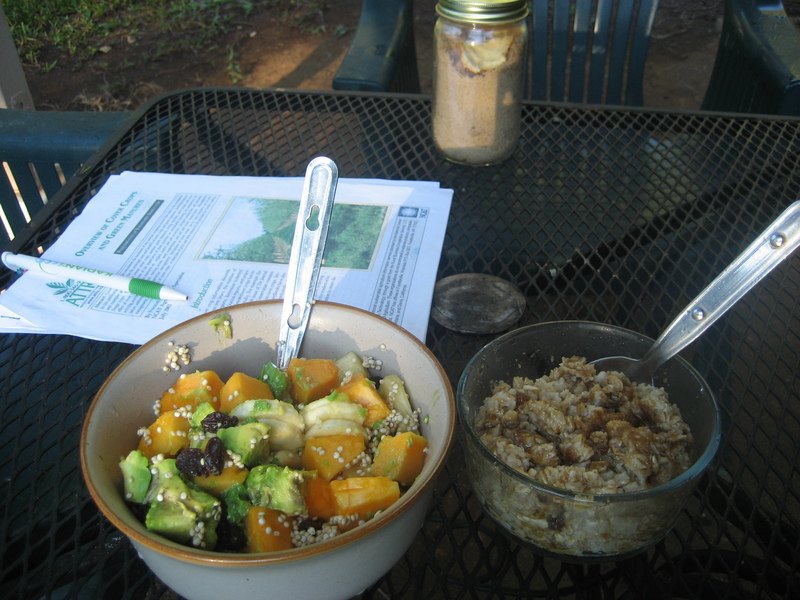 A typical breakfast (only now save the oatmeal). 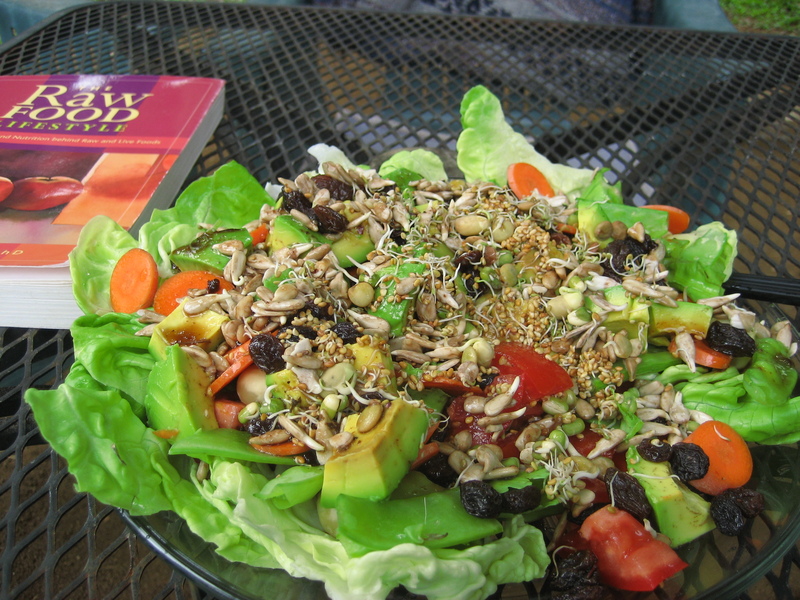 Usually just a medley of fruits; papaya, banana, foraged avocado, raisins, and sometimes some sprouts – all in an attempt to incorporate more raw food meals into my lifestyle. I’ve also got a published article on cover-cropping. 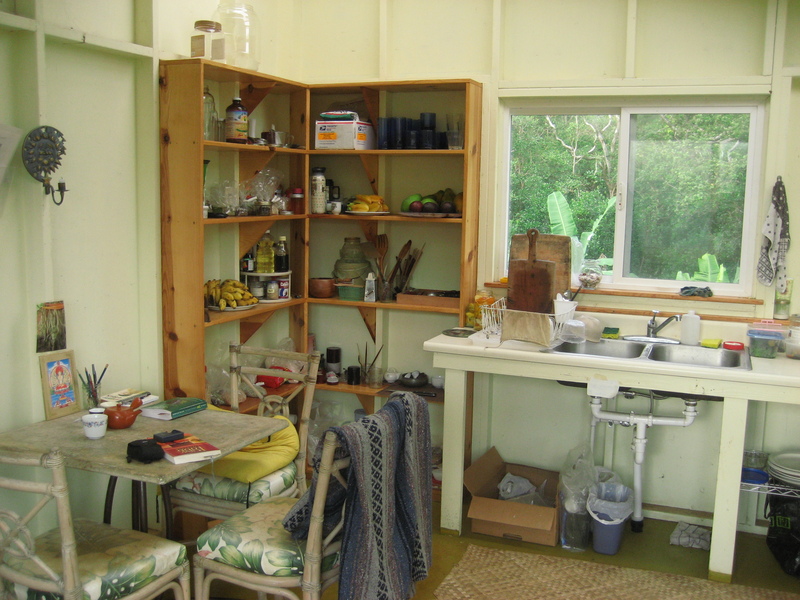 There’s a great library accessible to wwoofers at Mauna Kea covering topics on soil, natural farming, microbes, mycelium, mushrooms, cover-cropping, mulching, biology, etc., the list goes on. 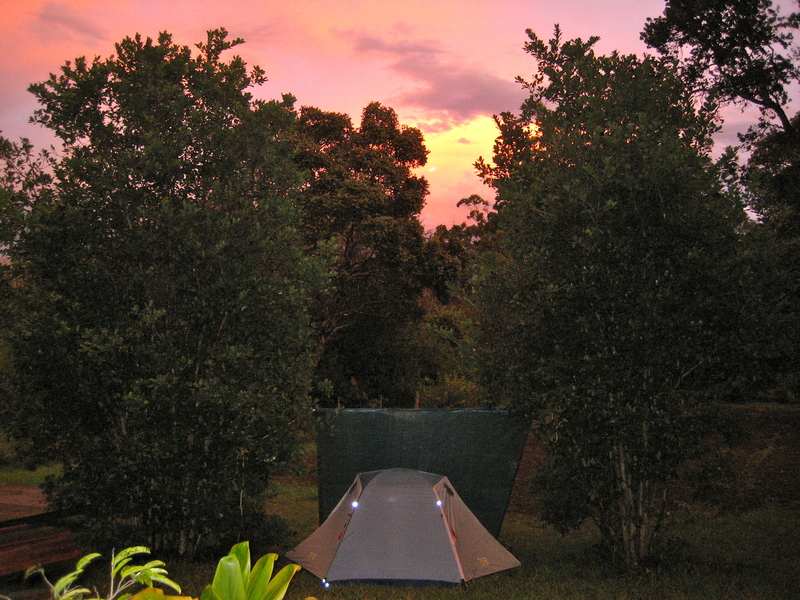 Welcome to our humble home at the base of the property! 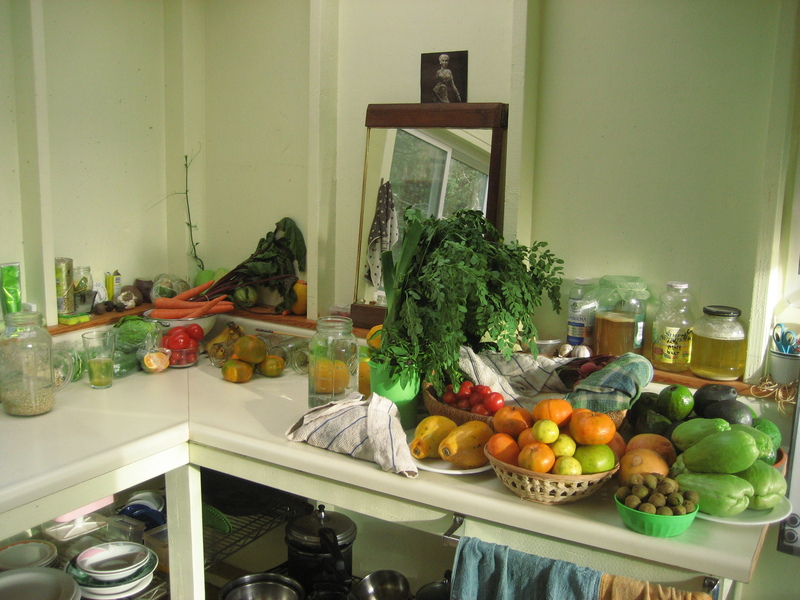 This is what a raw-food kitchen counter looks like! 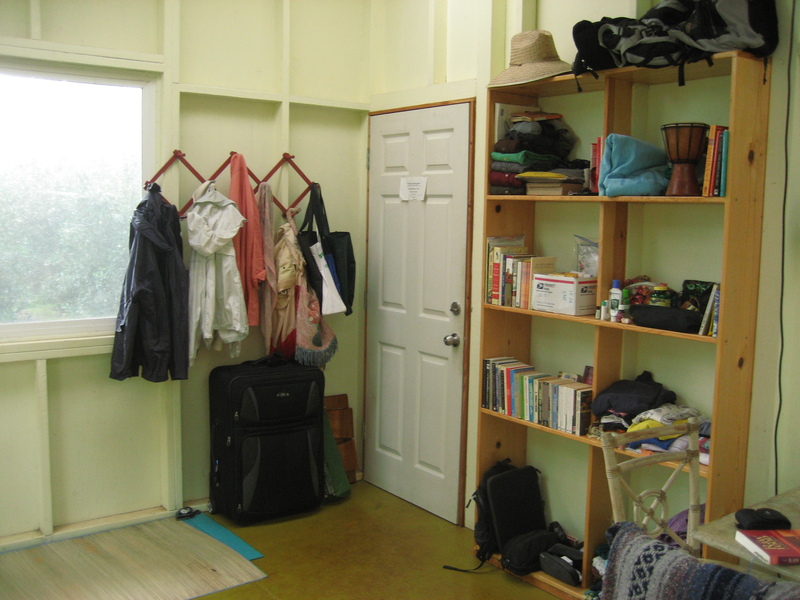 It’s also where we cook (or un-cook), relax, stay out of the rain, and mainly read; many many hours of silent reading goes on in here…Electricity is minimal and solar-supplied, but all we really need it for is light in the evening. 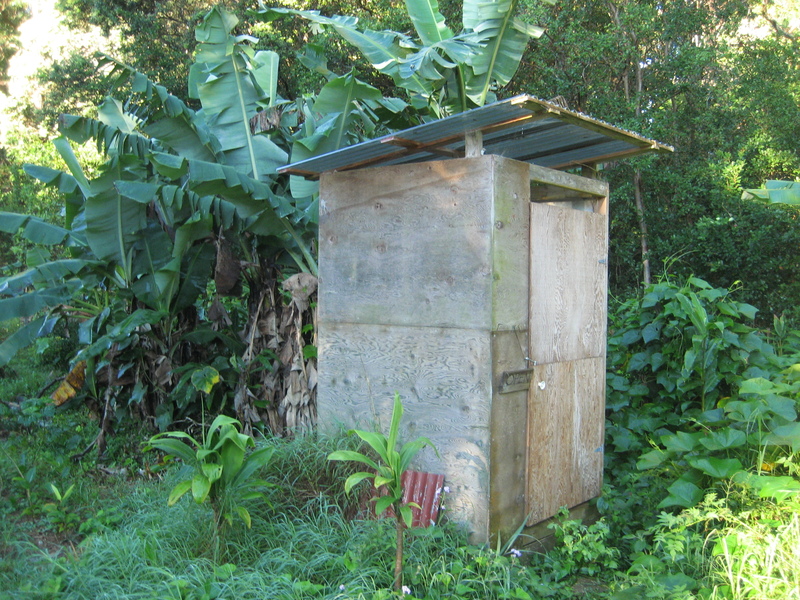 The amazing composting outhouse. 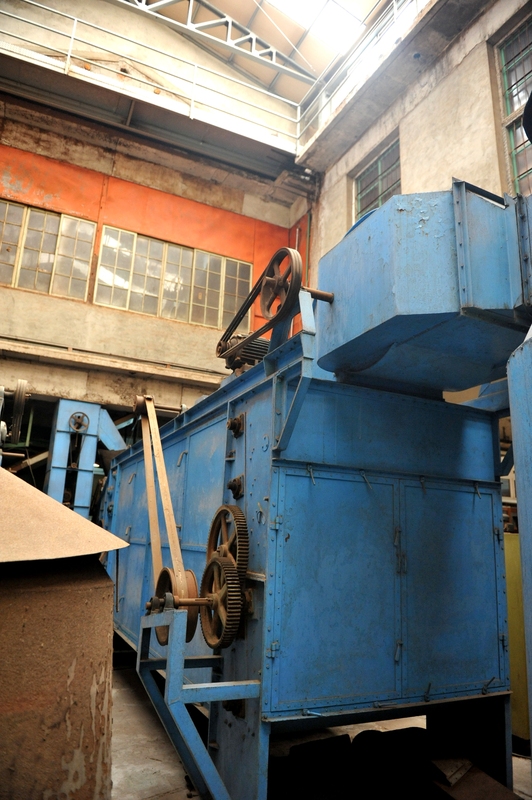 With the right amount of applied saw-dust and EM (Effective Micro-organisms) our waste breaks down at an alarming rate, and without the smell. It’s so effective the rising waste is hardly detectable and we won’t have to remove it for a long time. A new section of garden J ready to be planted. This has already been planted now by the other wwoofers. I’m currently working on different tea bed on quite a slope. I’m learning about contour planting to help prevent erosion during water run-off and for ease of harvesting. Without any fancy leveling equipment, I’m simply using a handheld level and properties of right angle triangles to create level rows of tea. After a machine operated cut-back, I finish off the job by hand hedging to create a nice level plucking table for next Springs’ flush. 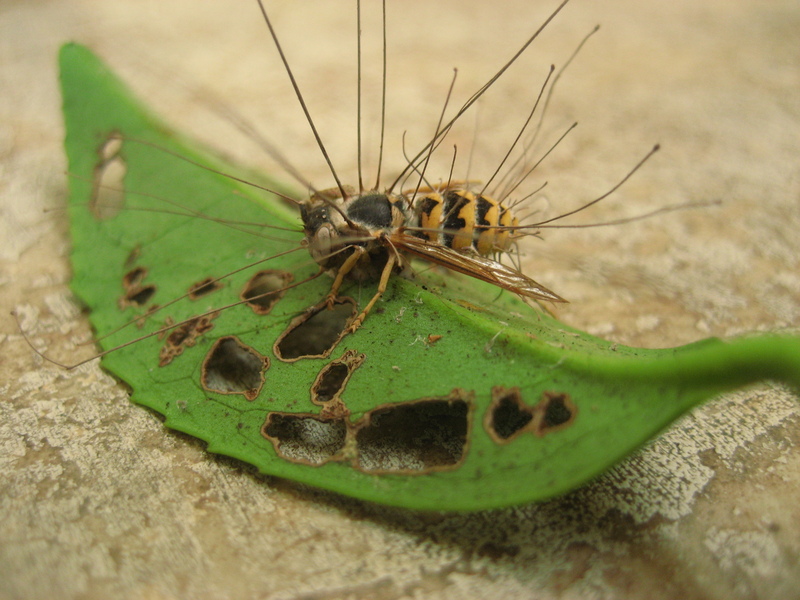 Natural Farming is host to a concert of symbiotic relationships! I believe this is some kind of fungi called cordycep that inhabits the host and messes up its metabolism, killing the host and then fruiting from the inside. 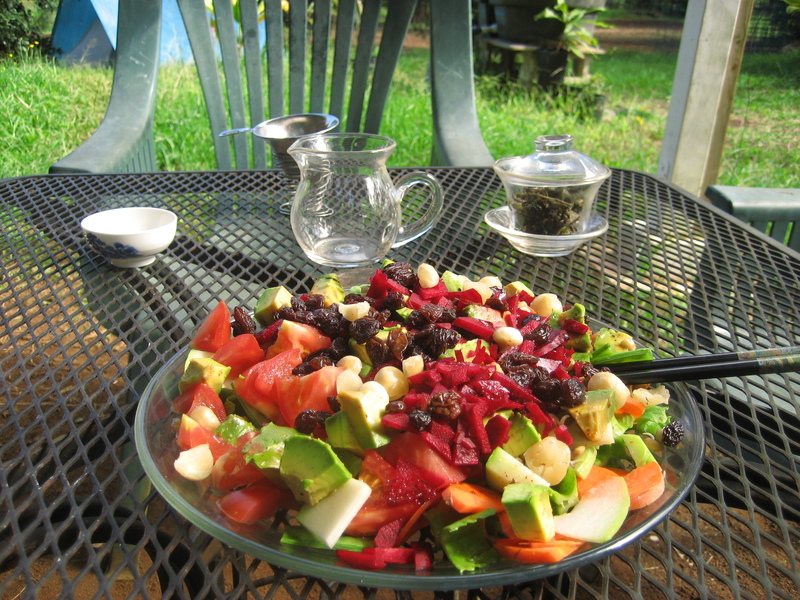 Lovin' Life and Livin' Love at Mauna Kea Tea! 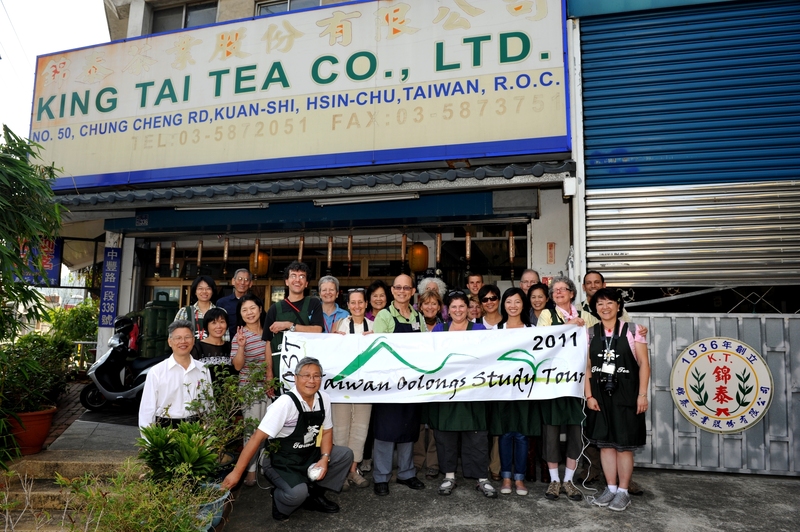 Taiwan Oolong Study Tour – Day 6! All right, this was the second to last day of the tour. 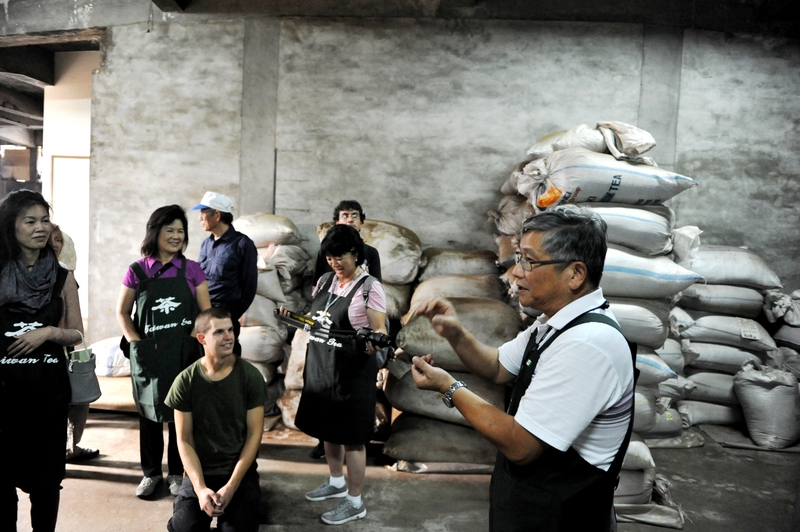 Since I haven’t directly mentioned it already, or if my blog hasn’t already persuaded you, or if you’re highly interested in Taiwan tea, tea farming, and tea processing – attend this tour! 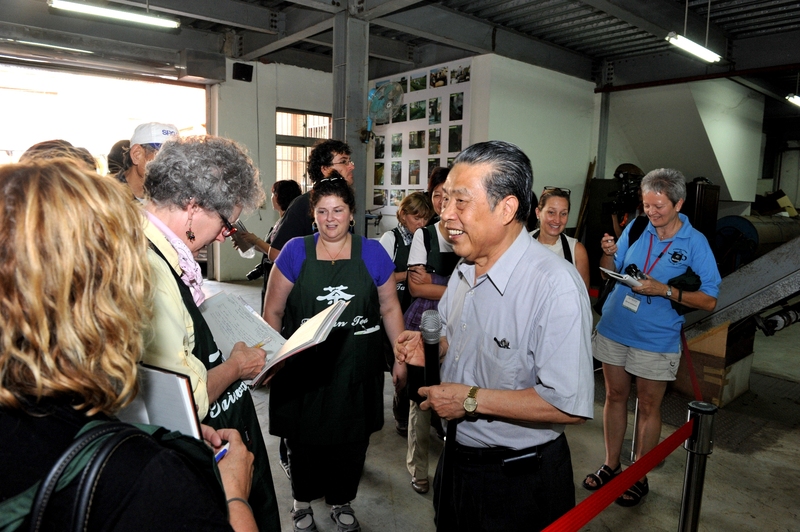 The experience offered by Thomas Shu, Josephine Pan, and volunteer staff far out ways the cost, in fact after attending the tour myself, I would pay double. As mega-ambassadors of Taiwan and Taiwan Tea, Thomas and Josephine have the connections and the heart to take you places and reveal information to you that would otherwise be strictly off-limits as a tourist or even as a resident in some cases! So off we went, over to the Oriental Beauty Tea District. This higher oxidized oolong tea is particularly well-known for its naturally occurring symbiotic relationship between the tea evergreen and a small green leafhopper. In the summer, this tiny hopper chews on the buds and upper tea leaves causing a chemical change in the structure of the leaf. Notice the pictures above with the various amounts of discolouration. As a result of this change, the processed leaf imparts sweetness like honey and plum-like flavour with a matching aroma. 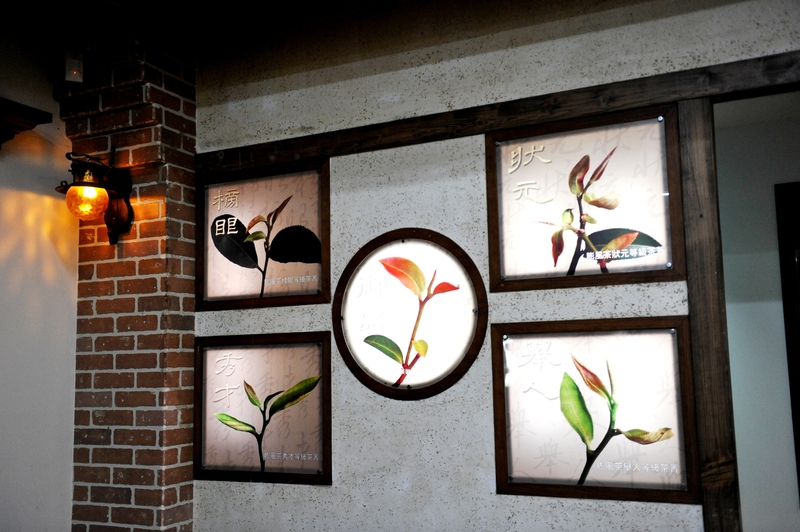 Oriental Beauty is a tea of many dry-leaf colours and equally as many names, such as White Tip Oolong, Five-colour Oolong, Eastern Beauty, and of course the associated mandarin translations of these. The cultivar, Chin Sin Dah Pan, is well suited to tailor this oolong, growing in Miao-Li and Hsin-Chu areas in northwest Taiwan. We had a chance to tour around an Oriental Beauty Museum in Beipu and here are some images capturing the exciting experience. This antique cupping counter was made in 1956! 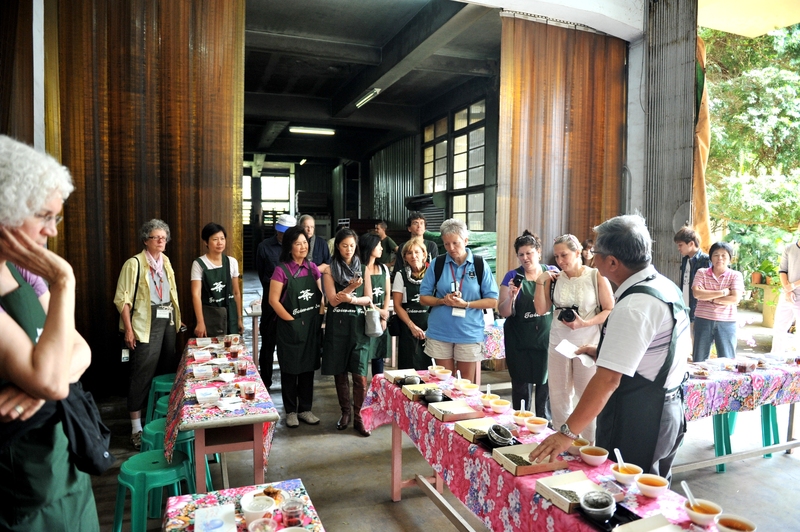 We also had the chance to learn about traditional pomelo tea baking! And, of course, it wouldn’t be a trip an Oriental Beauty Museum without a cupping of five different grades of Pon Fon Cha. 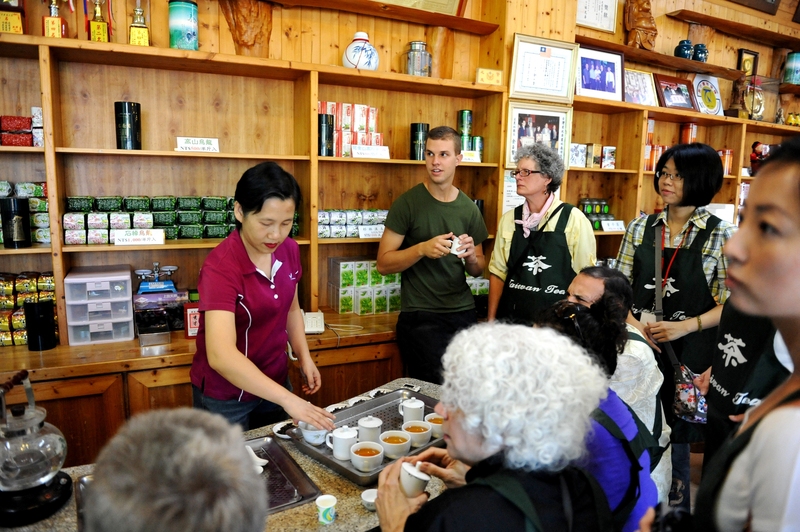 As well, everyone tried their hand at making Lei Cha, a ground up medley of nuts, seeds, and grains traditionally drank by the Hakka people of Taiwan. 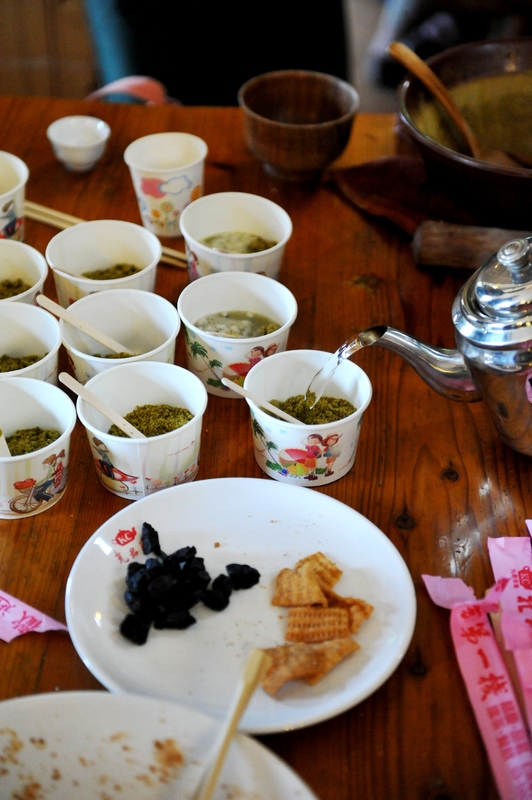 Some ingredients included peanuts, sesame seeds, sunflower seeds, dry oolong leaf, puffed rice, and green tea powder (different from Japanese Maccha). These ingredients are ground together using a mortar and pestle. The trick lies in the use of the pestle (and I think the course interior of this particular mortar). 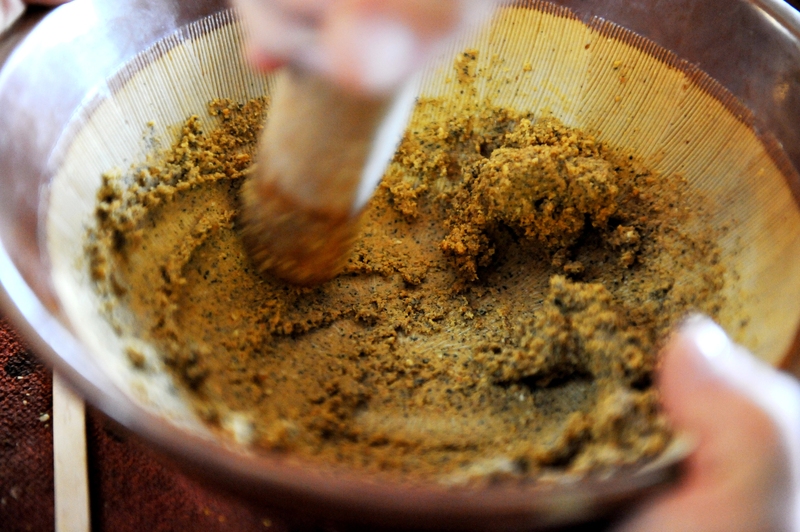 The grinding requires two hands on the pestle, one on top acting as a static pivot point, and the other holding the pestle from the side rotating it. After about 15 minutes of continuous grinding, the ingredients take on a paste-like texture. At this point, the green tea powder can be safely blended in, to which hot water is finally added, along with puffed rice. This hearty broth is actually quite enjoyable and filling. 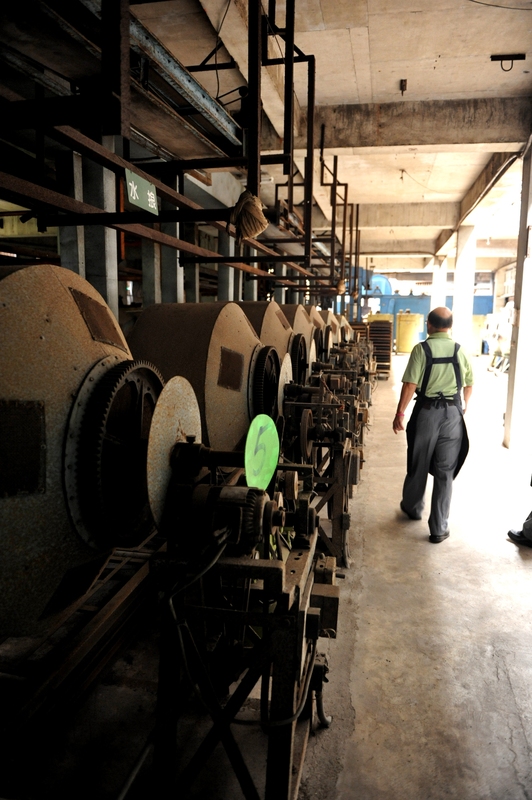 After our Lei Cha, Pomelo, and Oriental Beauty experience, we made our to the Sha Keng tea storage facility. This was a real eye-opener for me. 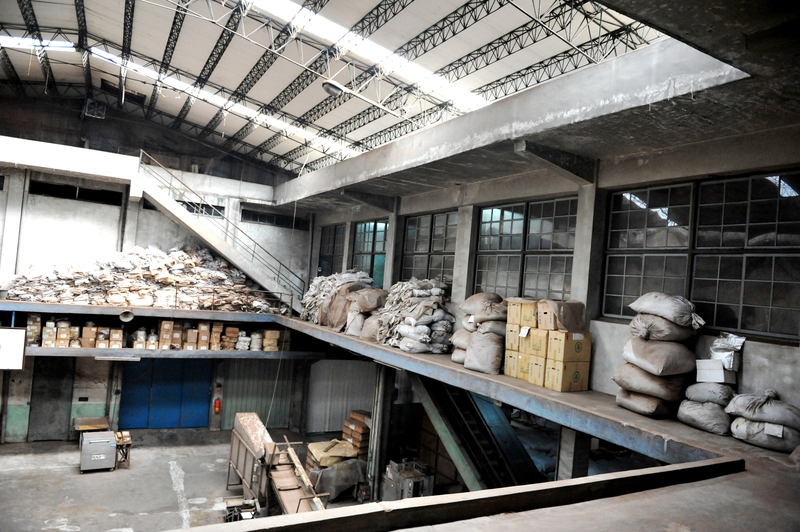 Coming from a small-scale tea farm where about 15lbs of tea is produced annually to this facility was juxtaposing to say the least. 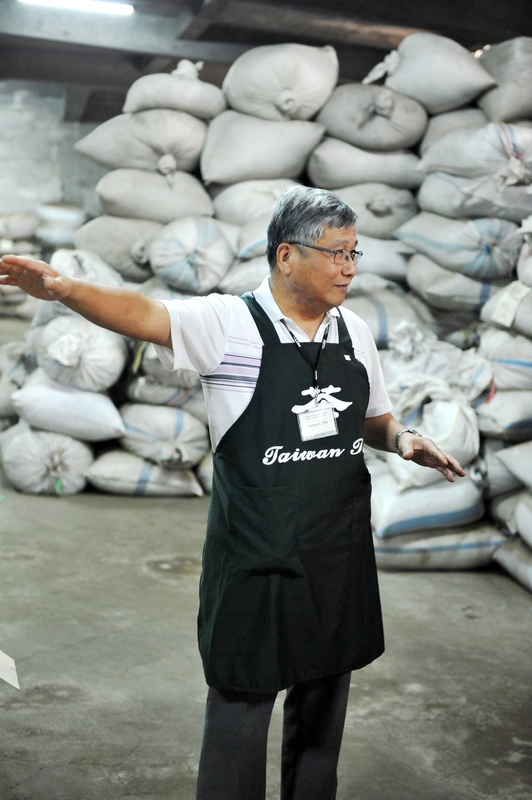 One of the members from G.S Haly and Company (a sort of tea broker) couldn’t really comprehend tea in pounds because he’s used to thinking in crates – which can hold 15 thousand pounds (correct me if I’m wrong here Mo!). I think he was a little more comfortable around all of this tea, saying, “Now this is what I’m talking about.” Haha, my eyes just kept saying, that can’t all be tea, can it? And apparently, this storage building used to be Twice as big, not to mention the half that still remains was only occupying about half of it’s potential!! That means, at one point, Sha Keng held more than 4 times what you see in these pictures, and these pictures can’t reveal it all either! The family and staff from Sha Keng treated us to one of the most delicious homemade lunches of the entire tour along with pomelo and citrus tea. 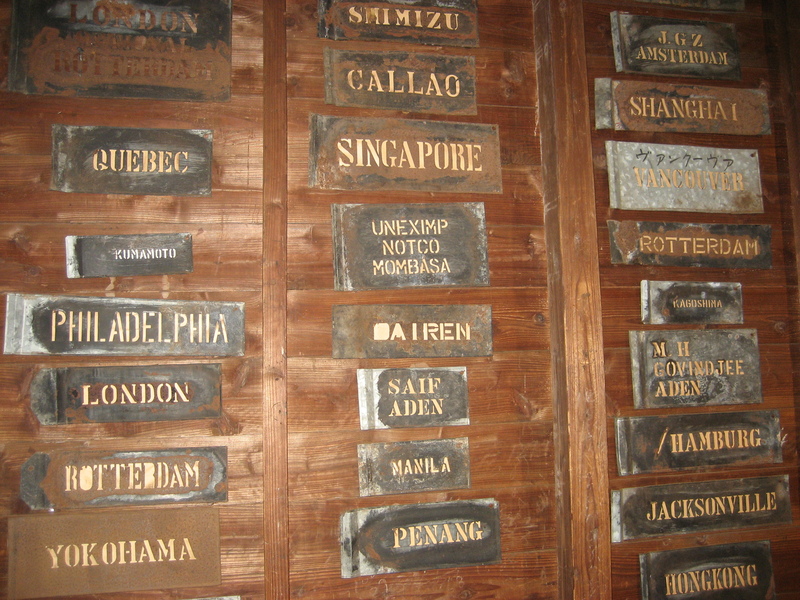 And if you thought we were done now, we still had TWO more tea museums to visit! First was the King Tai (Chin Thai) Tea Company. 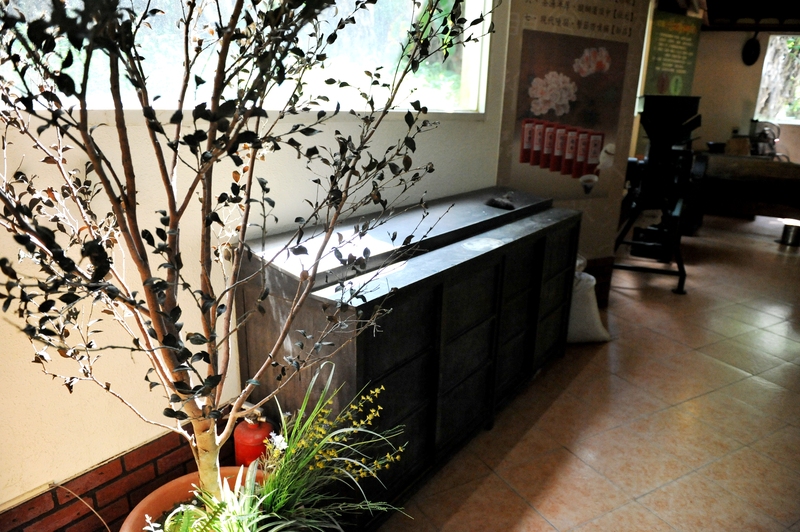 Located in the Guansi in the Hsinchu County, the Lo Family (a very common name in that area!) 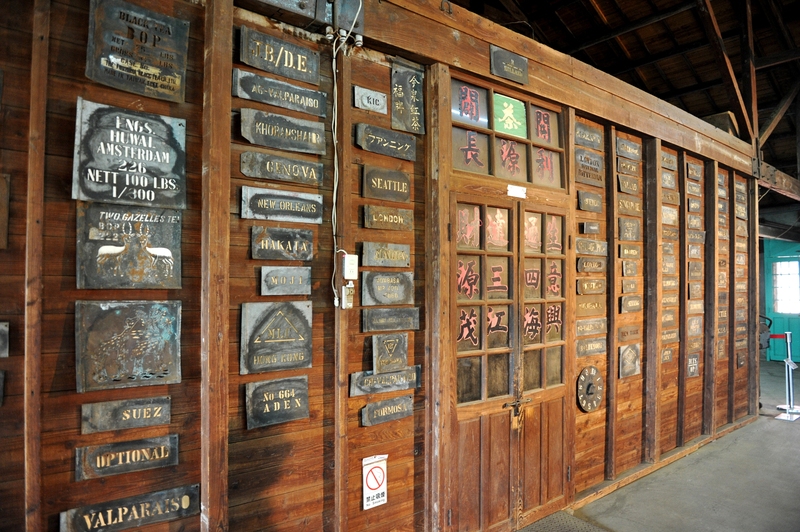 has preserved this museum so that we may witness the history of Taiwan Tea in this once-bustling tea township. Full of old and large machinery, the hustle bustle rhythm still clunked on when Mr. Lo started up some of the weathered hydraulic units and proceeded to run the machines. 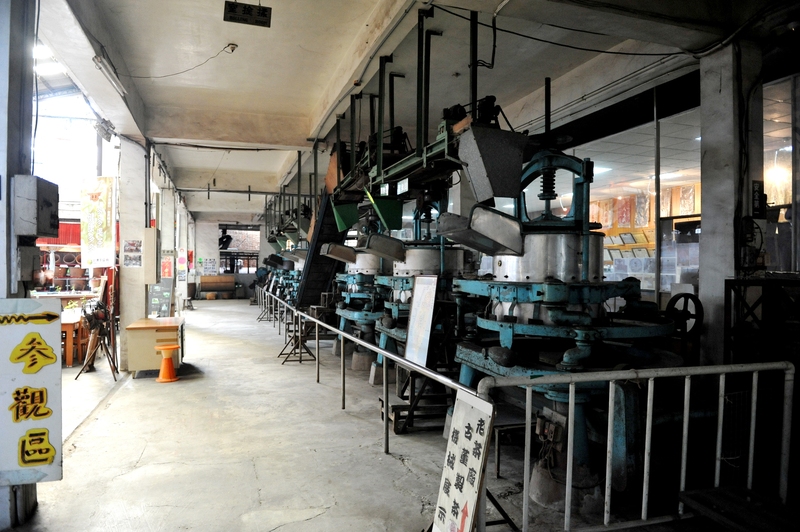 There were production lines with mega panning units, rollers, dryers, shaker-screens, and other large-scale tea processing equipment. 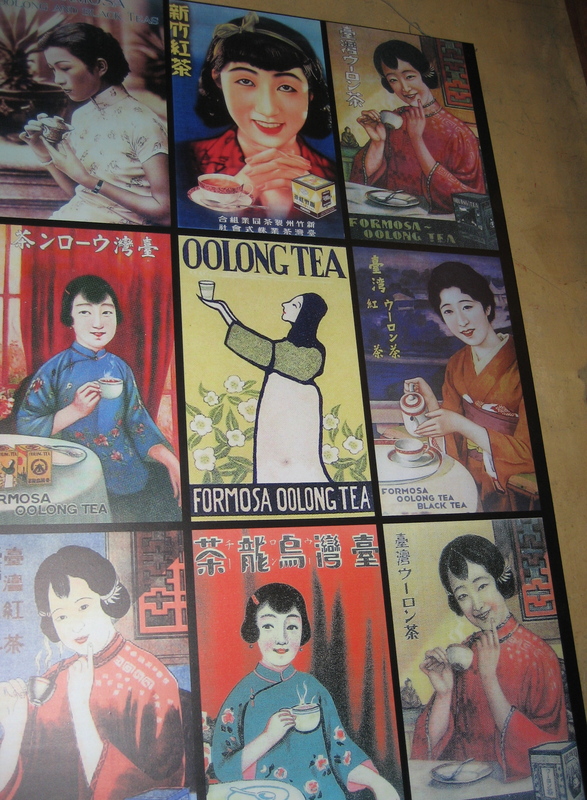 These were the old day of tea in Taiwan, or Formosa Oolong. 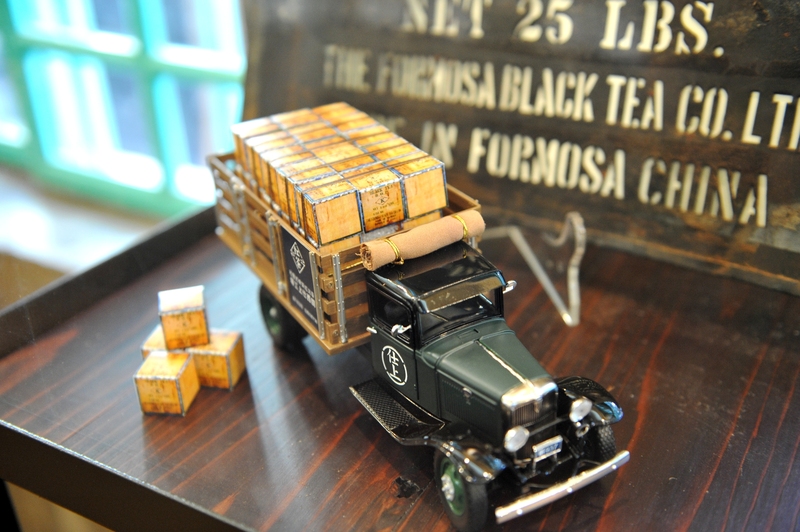 If that wasn’t enough, we then went to the Formosa Black Tea Museum managed by Mr. CS Lou, an energetic old tea professional carrying on the tradition of his fathers company. 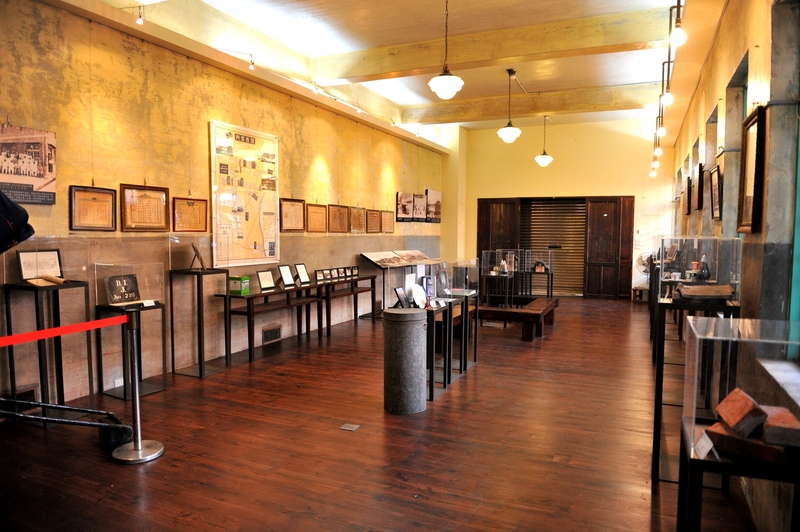 This museum hosts an outstanding display of historical photos and beautiful antiques. 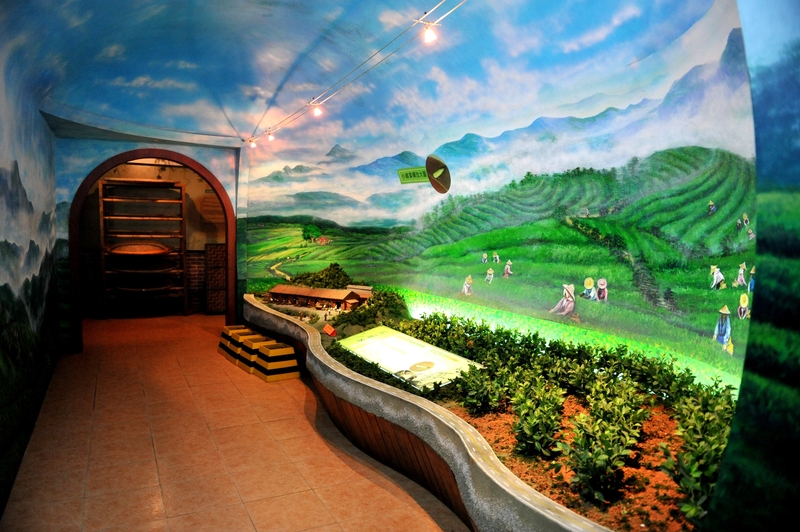 This place acts as both a museum and a tea production company, located under one roof. 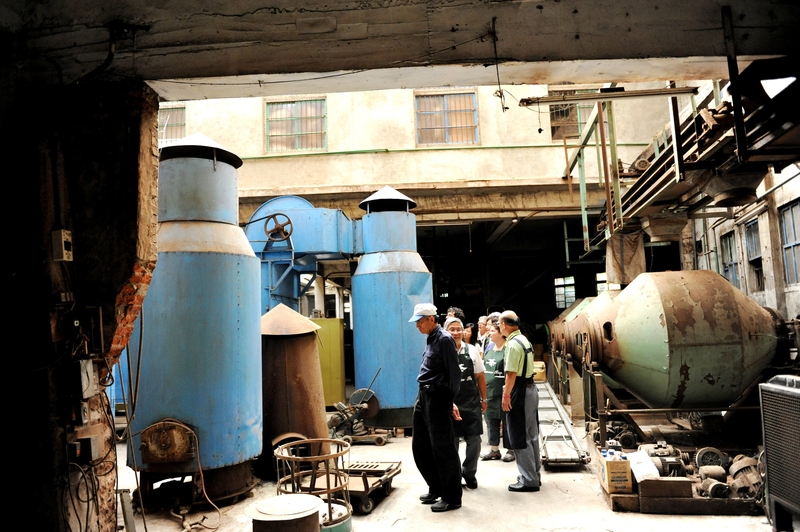 Really an amazing place to step into; knowing that major deals and cuppings took place in that very vicinity many years ago, and that tea is still being produced to this day. While the name might suggest an array of classic black teas, they actually produce Japanese-like green teas – who would’ve guessed? Mr. Lou focuses on a steamed green tea similar to Japanese Sencha and a ground up powdered green tea similar to Japanese Maccha. Interesting. After enjoying some of the green tea, the antiques, and the amazing history we held an open discussion on promoting the image of Taiwan Tea. 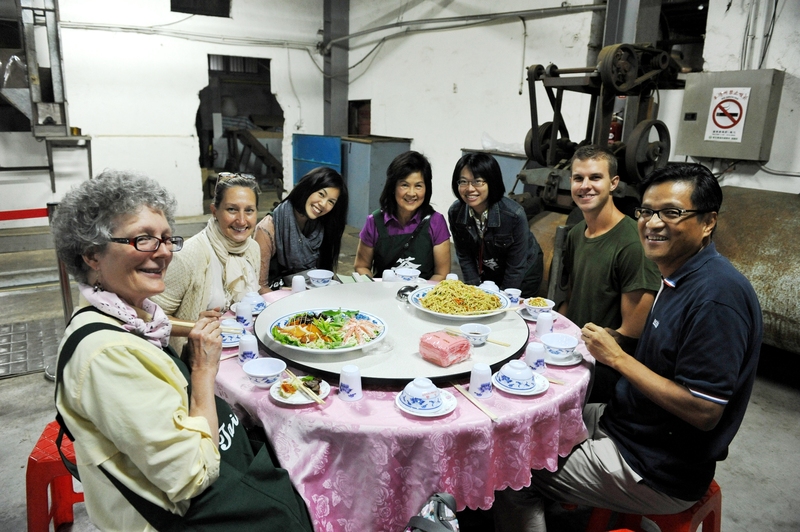 Followed by a traditional Hakka dinner, and just a few more tastings of tea – we called it a day! What makes wwoofing a particularly enjoyable sojourn, is that we are exposed to the farming environment without all of the major obligations of owning a farm! Some people might envision farming as simple, stay-at-home, honest work that puts money in the bank and food on the table. Sounds great right? Until you have all of these papers to sign, certifications to acquire, acres to manage, bills to pay, kids to look after, neighbors to deal with, cars to buy, emails to write, <insert obligation here> – you know, the typical daily chores that amass and consume our lives if we choose to let them. This is not the case for wwoofers. We get to enjoy farming for its fantasy, without the obligations – not to say this job is easy. Darn those freeloading wwoofers without their obligations!! Get a job already! Here, I can sit down on this mountainside in the middle of the Pacific Ocean, eschewing life’s conventional struggles and chewing food forty times to the mouthful. On some days, I might ponder what to make for my next meal. On other days, sometimes I forage for seasonal foods along the mountain roadside; avocado, loquat, macadamia, Brazilian cherries, guava, and citrus are ripening as we speak. You might think to look up for fruit in fruit-bearing trees, although looking to the ground reveals the hidden truth! Here, I can listen to nature; with wind so strong and trees so old, She howls. And, on the best of nights, I can sit outside by candlelight, drinking tea and cracking macadamia nuts under the influence of the moon. All the while learning about and living sustainably, practicing natural farming, managing healthy soil structures, and living in a simple and humbling environment. Like Do-Nothing Farming, it seems paradoxical that less is more. Doing nothing (or having a small input) can have a high yield, a grand outcome – and that’s not to say it isn’t hard work. It is to say that I can sit down and enjoy a cup of tea while Nature does what we think we need to improve upon, but you can’t improve upon Nature; Nature does it best. Well, I’m at it again! 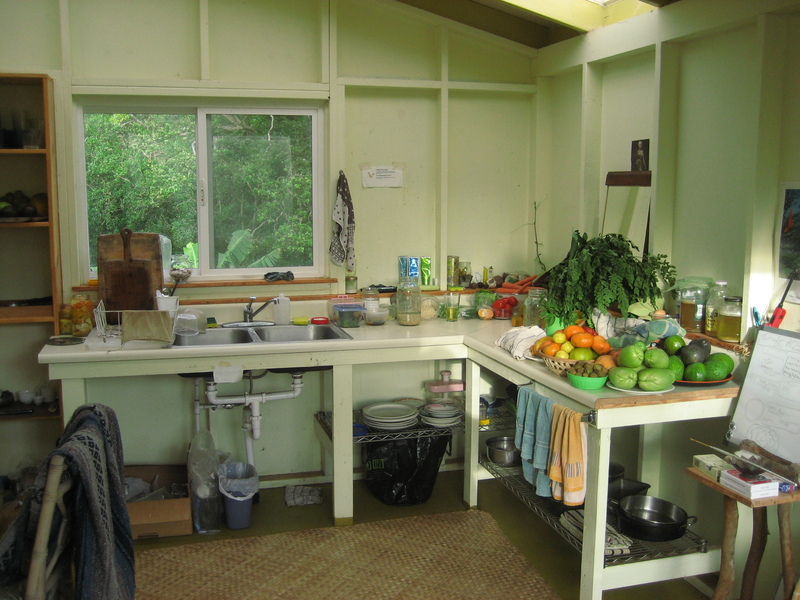 After loving 2 months in Kaua’i at Cloudwater Tea and 10 days in Taiwan – the queen of oolong tea – I now reside and WWOOF at Mauna Kea Tea Garden on the Big Island of Hawai’i. It’s much different here, in a very simple and also empowering way. 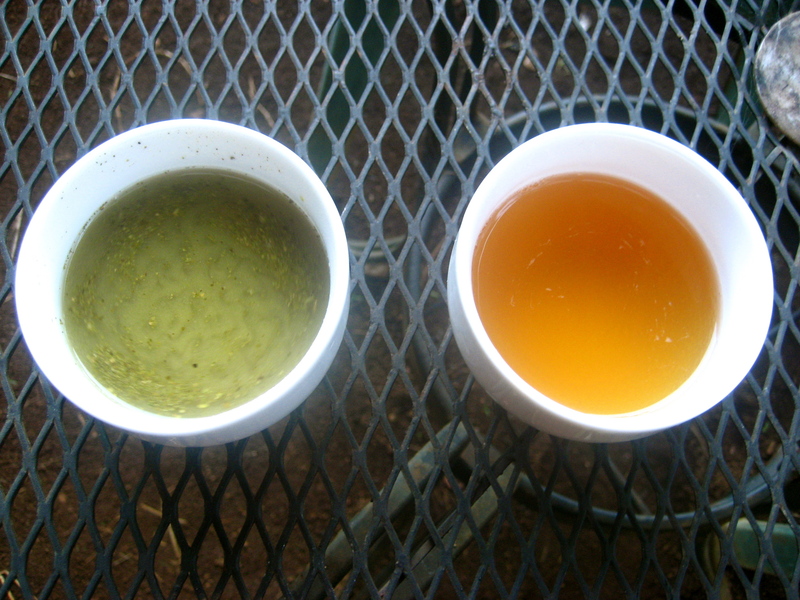 Mauna Kea Tea is up in the mountains of a small town called Honoka’a. The farm is 2000 feet above sea level and the clouds travel fast up here. 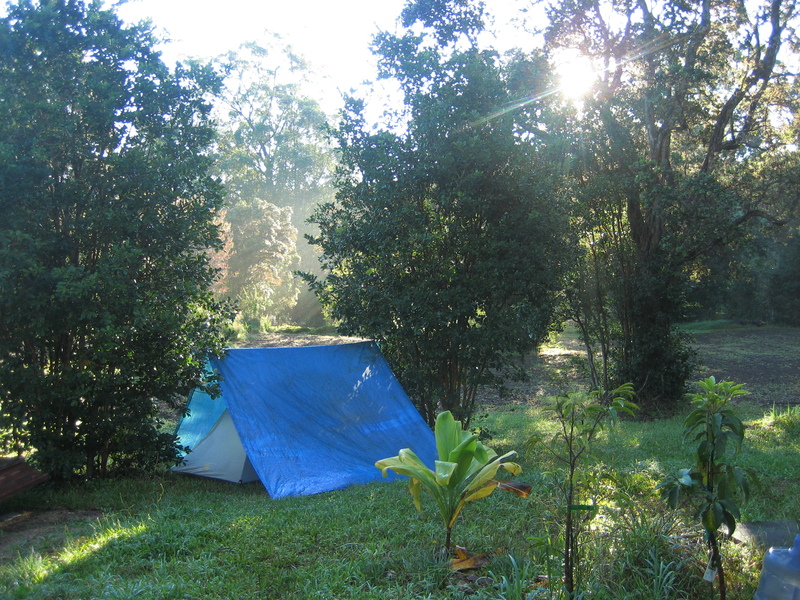 I live at the base of the property in my tent. 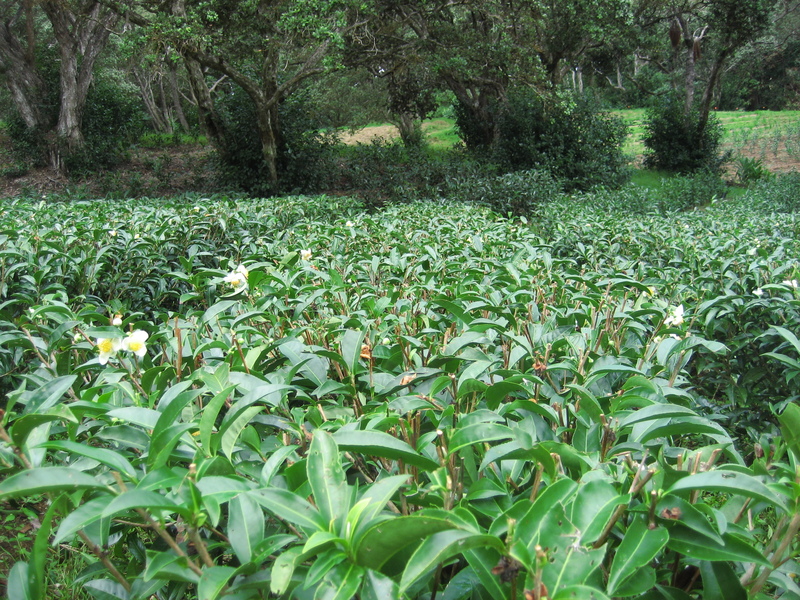 The tea evergreens here are smiling and beautiful; the farmer really knows his Camellia Sinensis and farming practices. 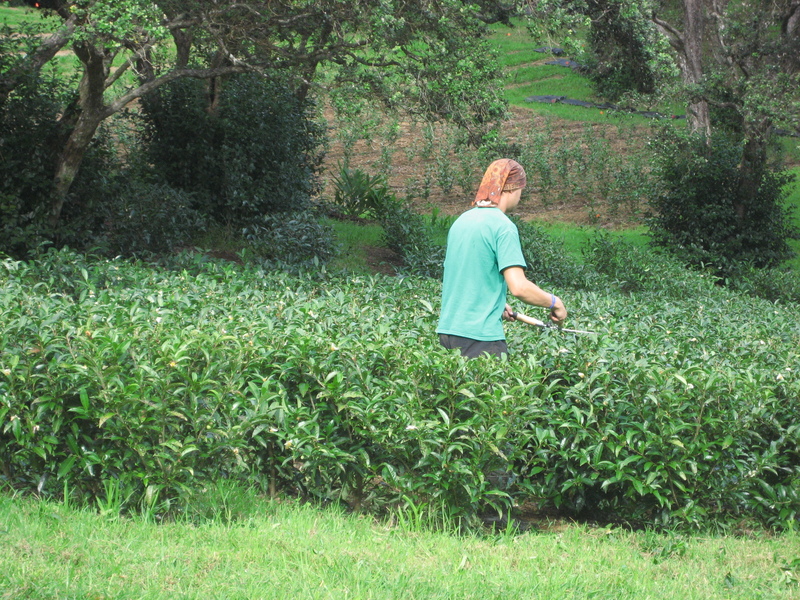 While he does all of the tea processing himself, I get to learn about tea in its natural state from cutting to harvest. (I say “natural” as opposed to conventional or even organic. I explain further down). I’m not sure of the cultivars, but there are both the China and India bush varieties. You can always visit Mauna Kea’s website for more information on their final product. There is a communal cabin for cooking and lounging. 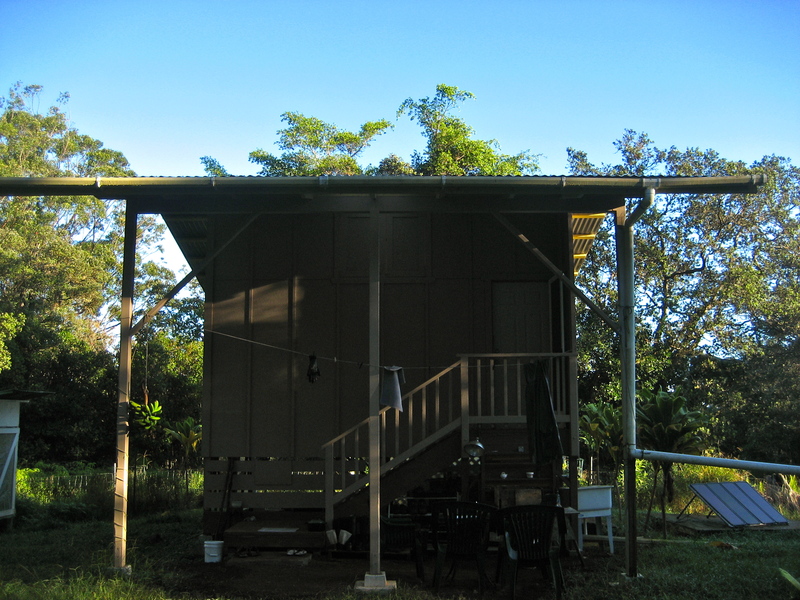 We have a propane-powered outdoor shower and cooking elements. 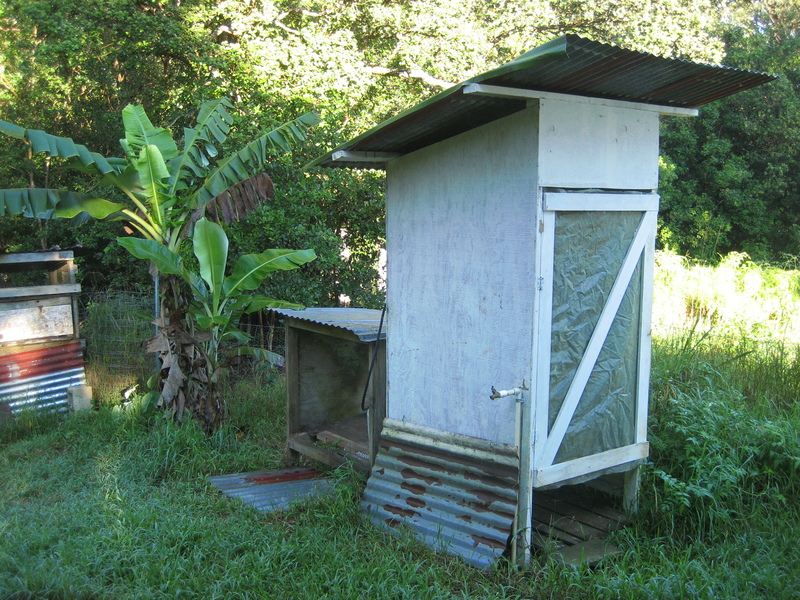 The outhouse is a squatter, electricity is solar supplied, and there is no fridge or any major appliances. 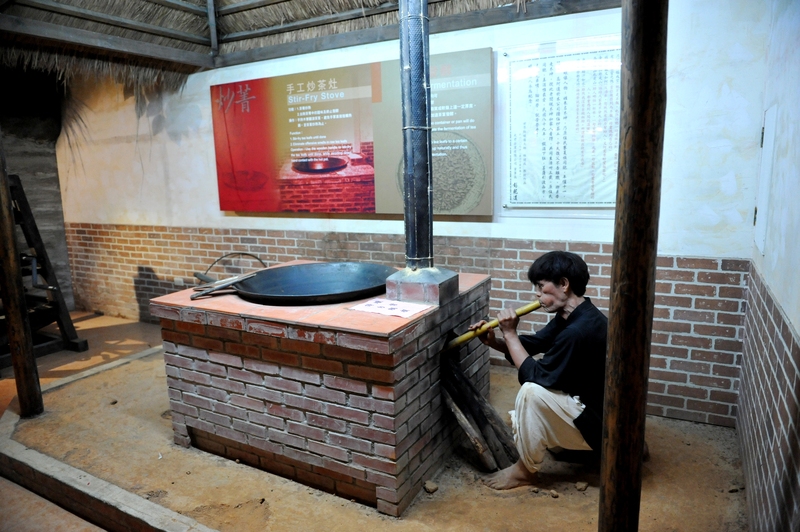 The lifestyle here is simple and humbling with basic foods and cooking ware supplied. I’ve suggested that the general theme here is, the less you have in life, the more forced you are to live. And here I am, forcing myself to live; otherwise, I don’t have the self-discipline to live under such conditions. I’m learning to cook with simple ingredients, tenting on a rainy mountainside, practicing the way of Natural Farming, and all done in the presence of tea. This (almost semi-primitive) lifestyle is simple, healthy, sustainable. While it might seem limited at first, they farmers here are actually providing us with an environment in which we can experiment and learn through experience. Instead of just giving us all of the answers and “necessities” we get to figure them out on our own and work with what we’ve got – it’s a very empowering environment if you choose to look at it in that way. 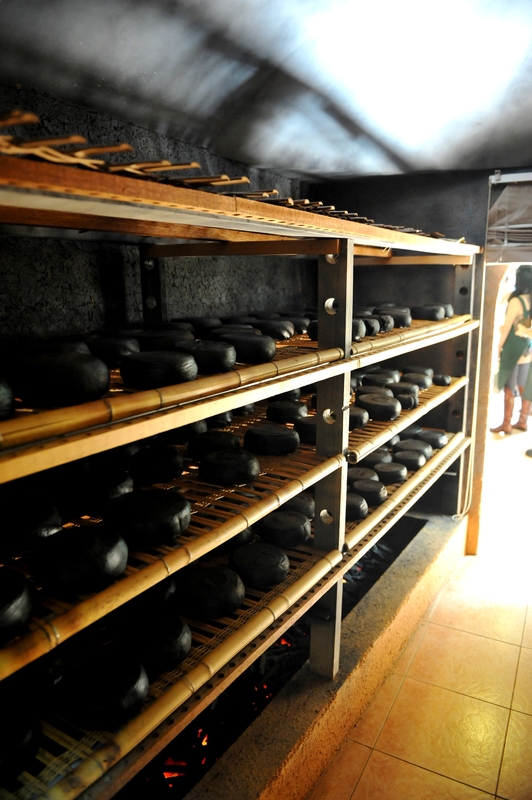 Plus, they don’t just talk about sustainability here, they apply it with their farming and daily living practices. I might add, just as a reminder, when I refer to tea, I usually mean tea as a beverage, an art, a culture, a history, a medicine, a metaphor; tea is an act of service, a welcoming… you get the point. 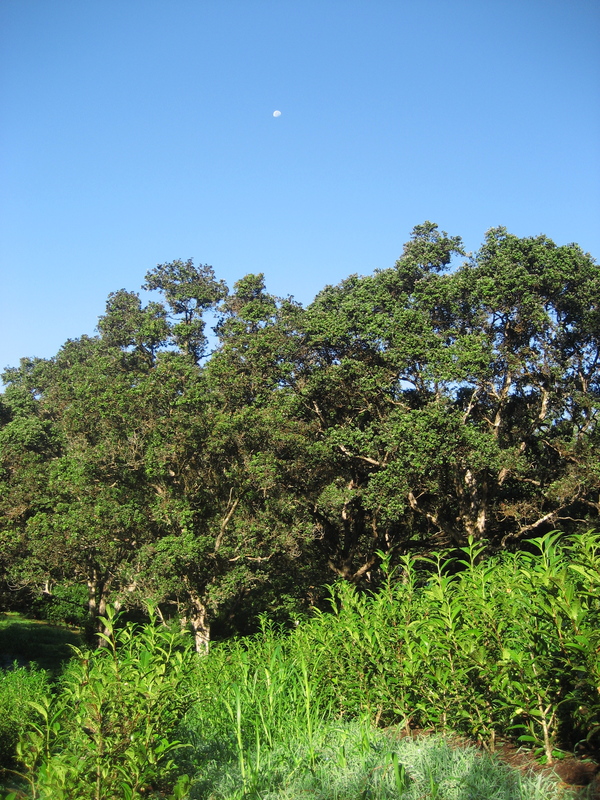 Back to the farm; uniformly scattered throughout the property and tea beds, old and ominous Ohia trees grow. Reaching out like shadowy hands against brick walls in a back-alley, their rough twisting branches offer dark and silvery shades of green leaves. Walking amongst the Ohia at night might cause an ominous internal stir, however, these aged giants are more like sages and guardians of the tea gardens. Bringers of shade and buffers of wind; their beauty is rustic, crude, weathered, and strong. Upon coming here and reflecting on the direction of my tea influenced travels, it’s boiled down to this: I’ve gone from drinking tea, to farming and processing tea, to where things stand now; strictly farming with tea. 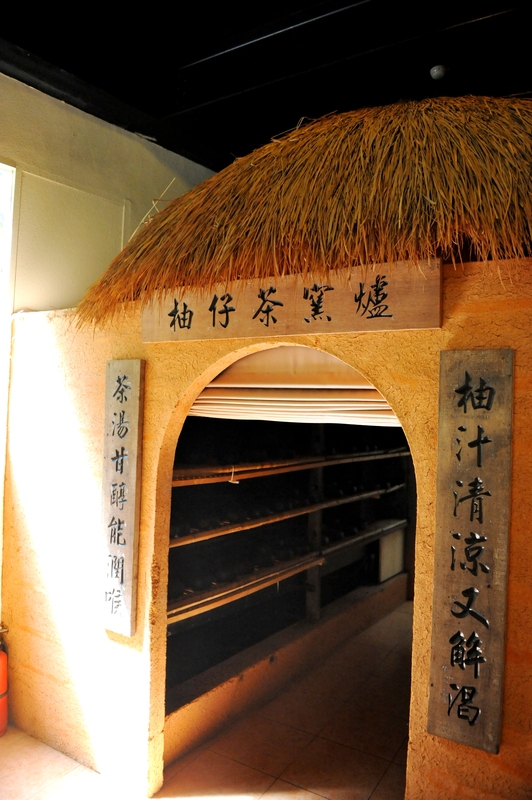 Originally, I wanted to go back to roots of tea – that being the farm. Now, as I’ve come to the farm, I am lead towards the roots of farming, that being Natural Farming, which follows a path (or pathless path to be correct) as closely aligned with nature as possible. 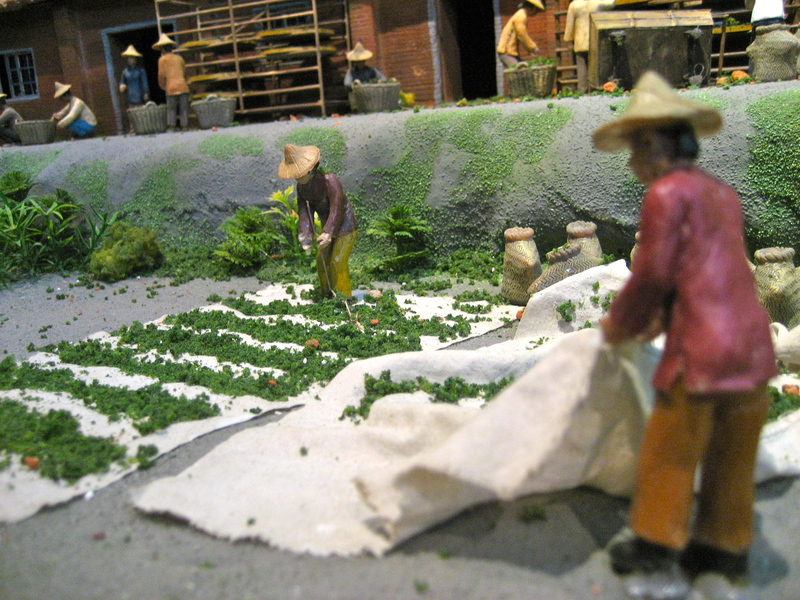 This is roughly the model of farming at Mauna Kea, which in turn becomes the model for growing tea, their mono-agricultural product. What is Natural Farming? Strictly speaking, hunting and gathering is the essence of Natural Farming, but for agriculture purposes, it means no chemicals or prepared compost, no cultivation (plowing or turning the soil), no weeding by tillage or herbicides, and no dependence on chemicals. 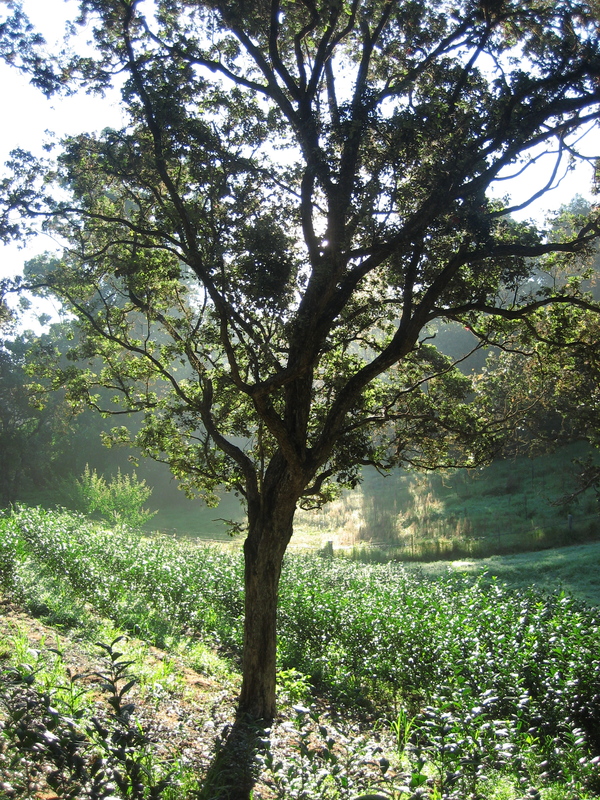 “The ultimate goal of Natural Farming is not the growing of crops, but the cultivation and perfection of human beings.” In one sense, it is a pursuing of the way of nature, but in a broader sense, it is a spontaneous communion between humans and nature that arises naturally of itself – something that cannot be pursued. When we let go of human will and allow nature to guide us, nature in turn takes care of everything. That’s the funny thing: it turns out that when you let nature take its natural course, all is well. “Nature is never in a hurry, yet accomplishes everything.” All of the so-called necessary farming practices are only necessary because we’ve created a system in which agricultural products are dependent upon them. When pests come, we use pesticide, and then our plants depend on the increased use of pesticides – a weaker plant (deviated from the norm) now exists and we think we’ve fixed the problem… If you let insects come, their natural predators will also come, and equilibrium will be established with time. Conventional farming is dependent on unhealthy and useless farming practices because that’s the system that has been created and perpetuated. That being said, there are no standardized methods to Natural Farming; it must be adapted and implemented accordingly based on your geographical location. I suppose I could paraphrase the entire book, but if you’re really interested, you should read The One-Straw Revolution by Masanobu Fukuoka. He goes against everything we thought we knew (in agriculture) in an attempt to show us we don’t know anything (in general) through the medium of farming. Natural Farming is sustainable, organic, simple, (enjoyable! ), and follows the path of nature.